The basics are this: many people, almost all bloggers, and most businesses, tweet, or have a page on facebook. I tweet a number of ways: through my twitter page, through text, and also through the platform TweetDeck. And it is because of TweetDeck that I'm a huge fan of the list. The twitter list function was founded in 2009 as another way to "follow" people without having them show up on your main feed. You can create your own list or view other people's lists at any time. Why do I like the list? Because it keeps my main twitter feed clean. I tend to only follow close friends, or people and organizations I connect with frequently. I don't follow very many people, but in total I'm looking at over 100 people's twitter accounts through TweetDeck. Likewise, some of the twitters I want to follow tweet over 60 times a day; following them can feel like you've just opened your email with pages and pages of spam waiting to be opened, when all you wanted to do was read your best friend's email. A list allows me to follow them without being weighed down. For the blog, I want quick and easy access to upcoming film, literature, and other blog news without having to see it constantly. 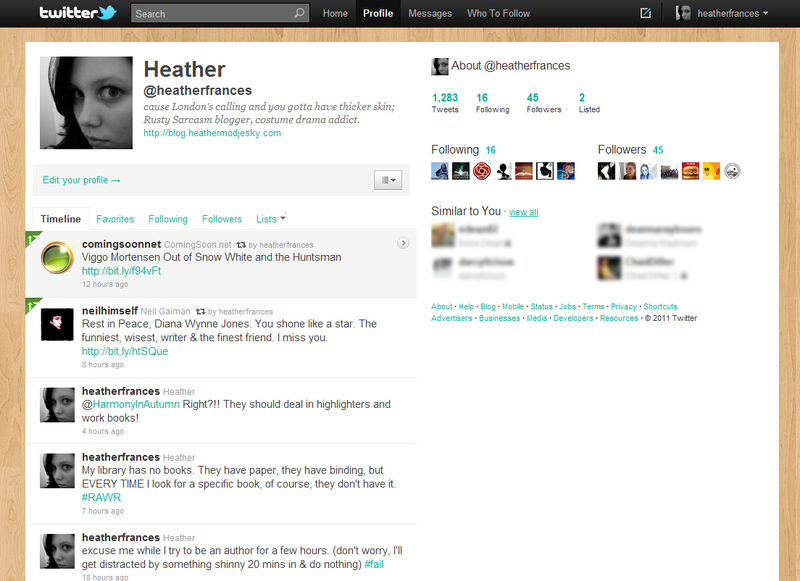 With listing, I can select when and how many tweets I want to see. Additionally, using TweetDeck I can see them all at once. It makes digesting large amounts of varied information much easier. What do your lists look like? Mine are very simple: good to know, authors and blogs, austen-bronte-gaskell, celebs, and all followed. In these 4 categories I can place almost any twitter user and be able to view their tweets in real time without following all of them. TweetDeck makes retweeting from these lists super easy AND will shorten URLs for you. It also has the ability to make a list of all your @mentions, or #specifichashtags which is invaluable during the rewatches and gives me the ability to quickly reply to my blogging peers. On the other hand, if you do follow a lot of people, you can make lists that would categorize the people you follow. Think about it as the above way, simply reversed. But isn't following better? Professionally, yes. At work, our goal is to get more followers to share our mission and connect with the local community, which often means following others first. We only have one list and that's resources for the organization, many of whom we also follow. And while I do consider this blog a professional venture, I use twitter more as an information tool than a promotional hub. As such, I'm not nearly as interested in the amount of followers I have, but that I am giving interesting and appropriate information out through my tweets. This also doesn't mean that if I start by listing an individual I won't end up directly following them. I am all for learning and all for changing. There is something to be said about the friendly follow back. People liked to be followed and many individuals will follow others back if you make the gesture first. But remember, getting followers really shouldn't be the only goal. All things considered, using lists becomes much easier and more of an option when using a platform like TweetDeck. It all depends on your perspective, preference, and your personal tweeting philosophy.